Groovy Cycleworks’s psychedelic plus bike appears to be smiling. Editor’s note: This post was written by Paul Skilbeck and Alan Davis. Photos are courtesy Brad Quartuccio/Philly Bike Expo. 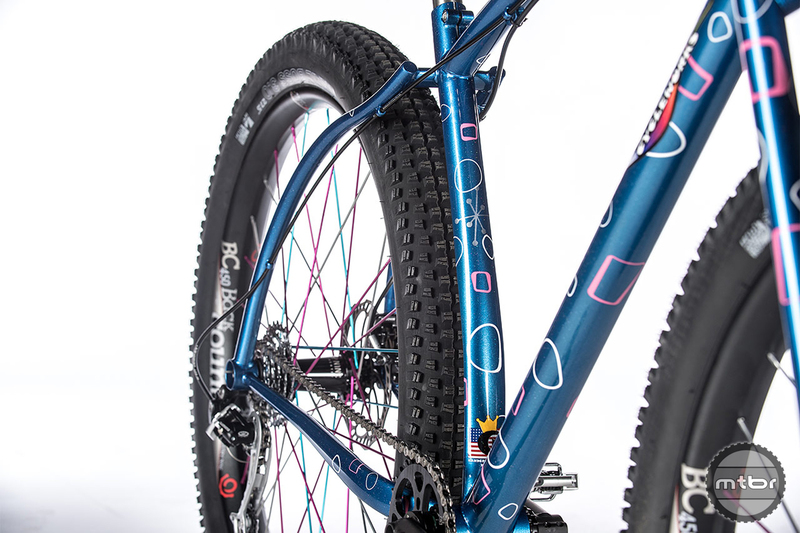 Here is the second of five best bike selections for singletrack from the Philly Bike Expo, the Groovy Cycleworks Funky Fun. Rody Walter of Groovy Cycleworks goes all in with the hippie, counterculture theme of his bike brand. His trade show displays feature images of VW camper vans, and peace symbols abound. Any Groovy Cycleworks bike is guaranteed to have a paint job that can be described as psychedelic. And Walter himself is likely to greet you wearing Birkenstocks. But Walter himself doesn’t get lost in the counterculture fog of dreamy idealism. His feet are planted firmly on the ground, and his realism extends to his relationship, as a one-man operation in the northern Ohio town of Wooster, with the large bicycle brands. The Man, if you will. The expertly applied Groovy Cycleworks paint jobs are all done in house. “I think the most exciting aspect of the bicycle industry right now lies in the cooperative effort between the large manufacturer and the hand built niche. 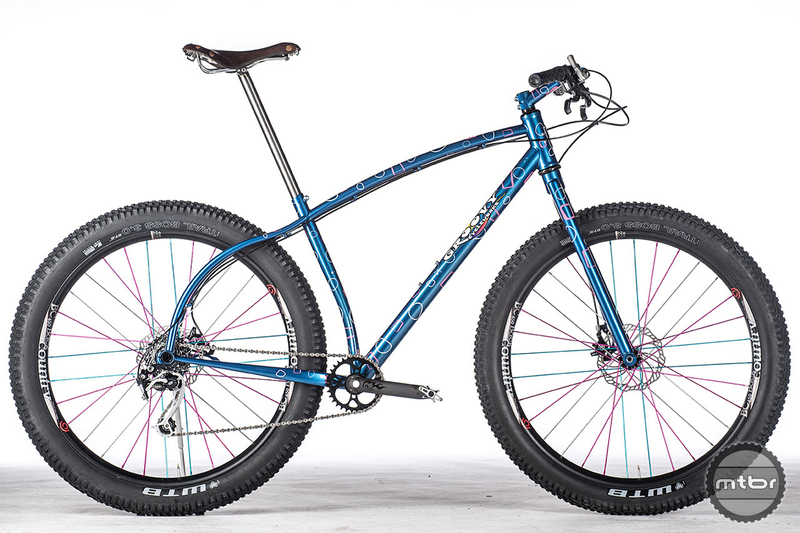 Now, more than ever, there are a group of experienced builders that can fabricate a bicycle that is focused on a customer’s physical, performance and aesthetic needs. Large manufacturers have embraced the small builder and made the latest technical equipment available at competitive price points so that a complete bike can be built without compromises. In the end, this cooperative effort benefits the bespoke customer, enriching an already valued relationship between customer, builder, and large manufacturer,” says Walter. The cooperative relationship Walter sees between large companies and small builders doesn’t mean that he’s “sold out”, however. For Walter, building bicycles is a holistic process that involves the vision and labor of the builder from fit to finish, and it doesn’t permit the bicycle to leave the care of its creator along its path to finished product. 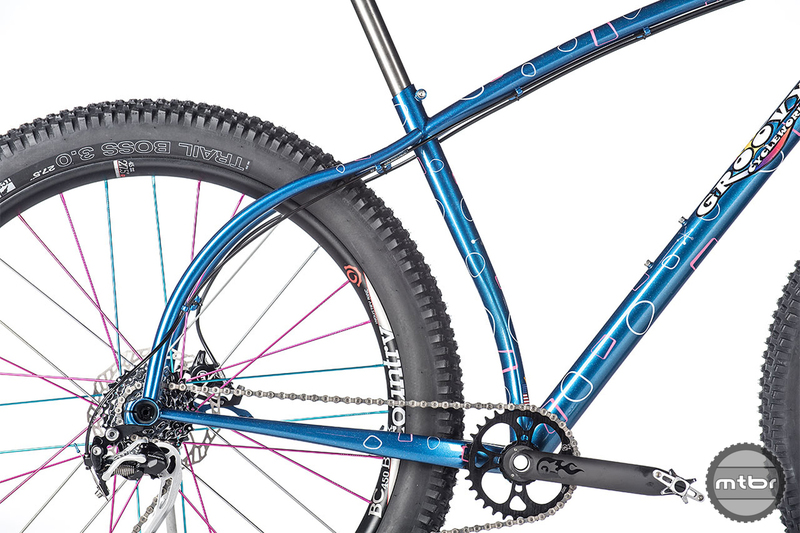 Groovy Cycleworks’s psychedelic plus bike stays flare out to make room for big tires. Walter got his start in the early 1990s after a quest to design a new tandem for himself and his wife Christi took him over the state line to Grove Innovations in Centre Hall, Pennsylvania. 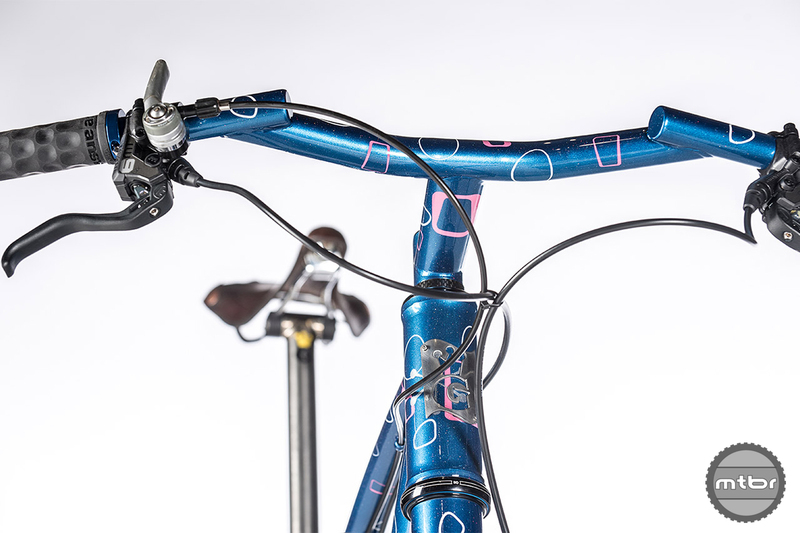 While working with Bill Grove on the tandem project, Walter became increasingly intrigued with the frame building process, and began to pester Grove with requests for an unpaid internship. Finally, Grove relented, with the admonishment that Walter work hard and keep his mouth shut. 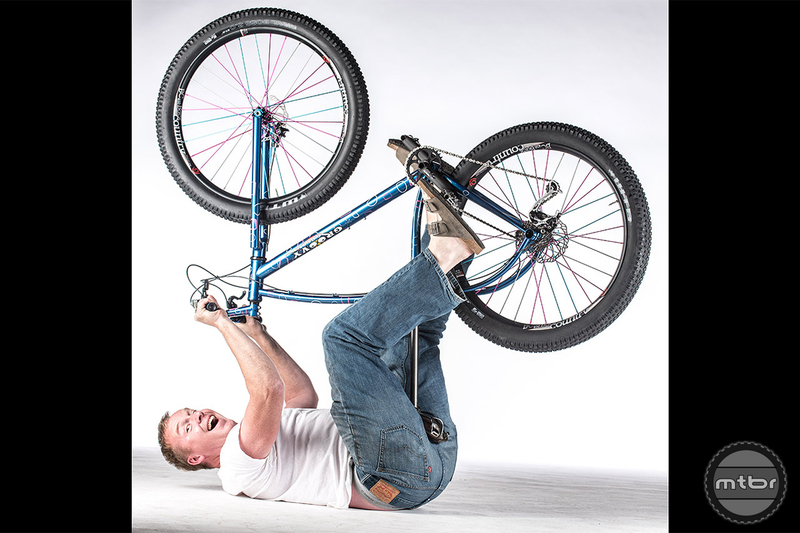 Groovy Bikes look like they are the essence of fun and it all starts with their creator, Rody Walter. “I’m willing to put the work in…but I can’t guarantee the second,” said Rody Walter with a sheepish grin. Two years of hard work and with a steep learning curve behind him, Walter opened up Groovy Cycleworks in his hometown of Wooster in 1994. His reputation for high quality and unique designs has garnered him praise and awards. 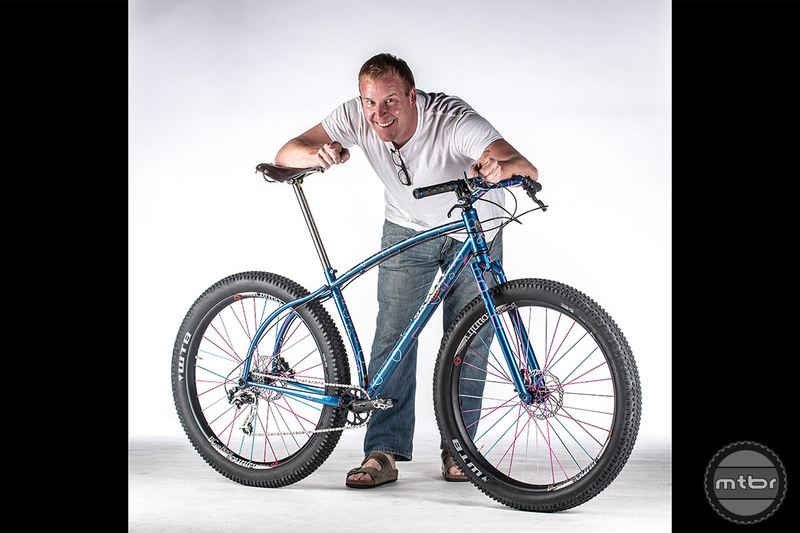 He won the Best of Show award at the 2015 North American Handmade Bicycle Show (NAHBS) in Louisville, Kentucky. 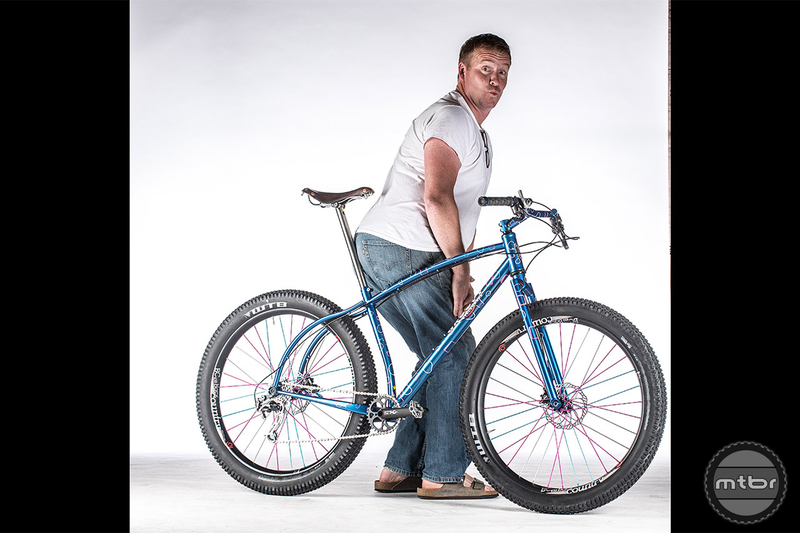 Groovy Cycleworks’s psychedelic plus bike looks as fun to pilot as a VW bus to Woodstock! These plaudits have also produced a sizeable list of customers. So long, in fact, that Walter is not currently accepting new orders. It’s the classic small builder’s catch-22: compromise creative integrity and the wait time will decrease along with demand; maintain your quality standards and demand, and the wait for a new bike, increase together. Walter is unwilling to compromise his standards, but again with the realistic and mature realization that nobody is perfect. Groovy’s unique handlebars are called Luv Handles and made from 3/2.5 Haynes Titanium. “Mastery is never achieved, but one must strive to move closer to it with each build,” Walter claims. Whatever new heights his pursuit of perfection will bring him to, one gets the sense that Walter will never let frame building become a chore, nor will he let himself go through the motions of fabrication, as a machine would, without devoting his creativity and soul to the fruits of his labor. 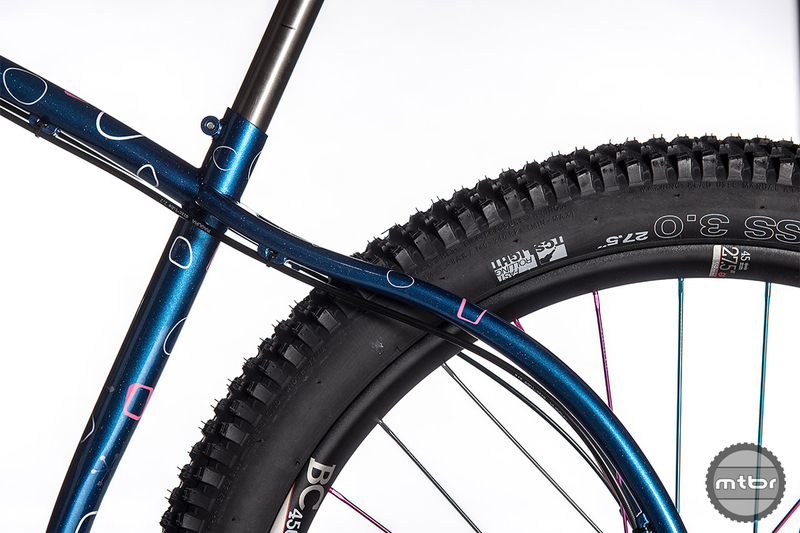 Groovy Cycleworks’s psychedelic plus bike tubes are elaborately bent to make room for the tire and to add compliance. As two other hippies turned ice cream magnates (that would be Ben and Jerry) once queried in a corporate slogan, If it’s not fun, why do it? Rody Walter clearly follows this groove. For more information, visit www.groovycycleworks.com. 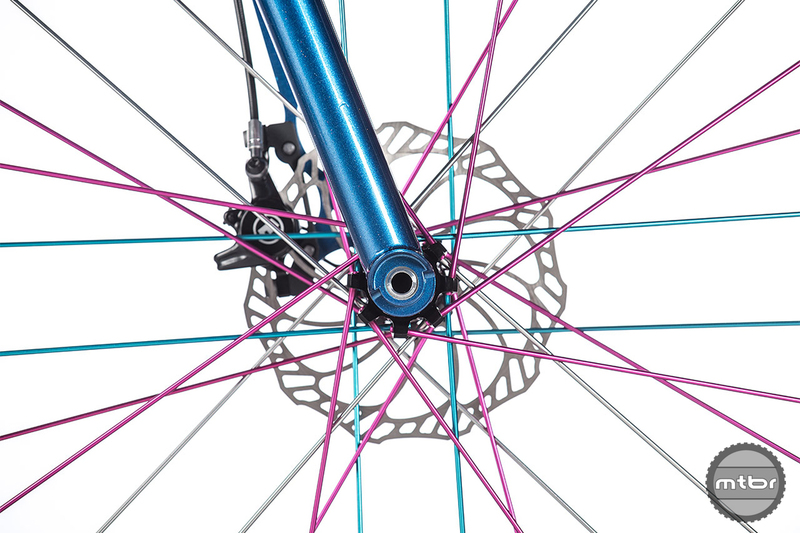 Even the spokes are psychedelic at Groovy! 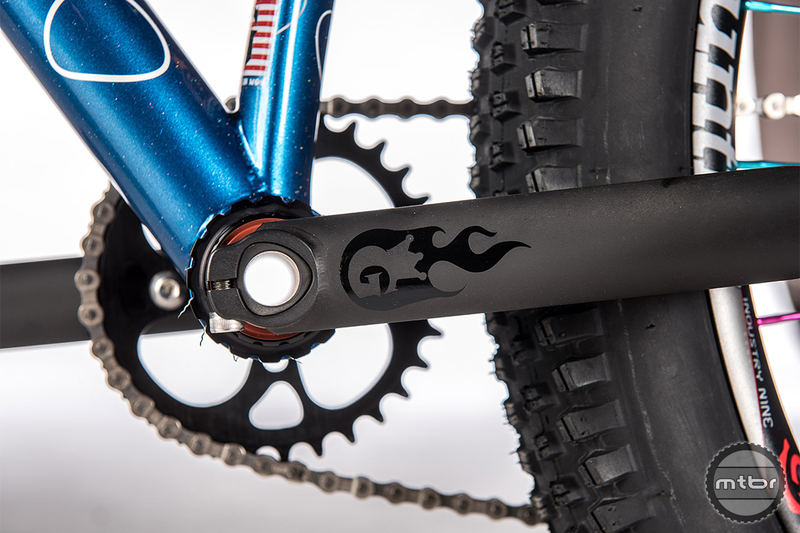 Groovy Hot Rot Cranks evolved from the original Grove Design 2-piece cranks made in 1978. Groovy Cycleworks’s psychedelic plus bike and its playful creator. 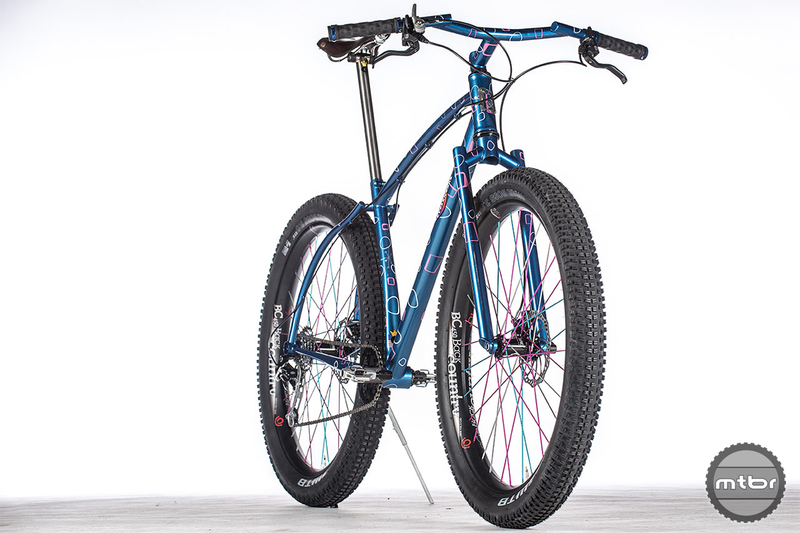 Groovy Cycleworks’s psychedelic plus bike is not boring.